Mud. Rocks. High water. Fallen trees. Snow, sleet and hail. Torrential rain and gloom of night. Those who know why they need the legendary off-road prowess only a Jeep Wrangler can provide also know that Mother Nature is always trying her level best to kill ordinary vehicles that venture out past where the streetlights fade, in search of adventure your average 4×4 just can’t reach. For those who see the end of the pavement as a challenge, not an obstacle, there’s the all-new 2018 Jeep Wrangler JL. 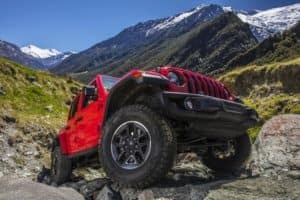 The first new Jeep Wrangler in a 12 years, the 2018 Jeep Wrangler JL is tougher, stronger and more capable than any Wrangler Jeep has ever built, and that’s saying something. Don’t believe it? 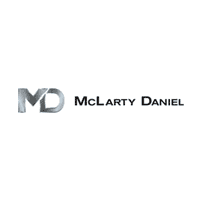 Come see us today at McLarty Daniel Chrysler Dodge Jeep Ram Fiat in Springdale, test drive a 2018 Wrangler JL, and see for yourself. We’ve got the latest and greatest models of the new Wrangler, and with more arriving daily, we’re sure to have the new Jeep that can get you to your own adventure and back in safety, comfort and style. Stop in today, or shop our big selection of 2018 Wrangler JL models online now. If it ain’t broke, don’t fix it, and the 2018 Jeep Wrangler JL follows that wise advice by only subtly tweaking the classic Jeep shape. Up front, the iconic seven slot grille is still there, though larger headlights push into the outer grille slots, while the top of the grille has more of a rake for improved aerodynamics and less wind noise at highway speed. The overall stance of the JL is wider than ever before, with a lower beltline and larger windows than the previous model. Daytime running lamps are hidden as a halo around the headlights, and the two-piece body-color fender flares allow for greater suspension articulation without rubbing while striking a more aggressive and muscular tone. New on the JL is a front header bar that’s integrated into the roll cage, allowing the windshield to be folded down by removing four bolts. The JL continues the long Jeep tradition of removable doors, but makes the process even easier through the use of aluminum alloy in the door skin and frame. Also new on the JL are several improved, more watertight roof options, including the premium Sunrider soft top with more bows to keep the fabric more taut, and rear panels that slide on and off without easily-stuck zippers. Also new is the Wrangler JL’s Sky One-Touch power top, that opens 90 percent of the roof to the sky at the touch of a button via a sliding cloth panel. Under the hood, the all-new 2018 Jeep Wrangler JL offers two engines, starting with the all-new 2.0-liter turbocharged inline four cylinder that makes 270 hp and 295 lb.-ft. of torque, while maintaining a whopping 24 mpg combined. Slightly more power is available from the tried-and-true Pentastar V6, at 285 hp and 260 lb.-ft. of torque. A 3.0 liter turbodiesel V6 with 260 hp and 442 lb.-ft. of torque will reportedly join the Wrangler JL engine lineup next year. Whether you want a manual or automatic, Wrangler has you covered, with the option of an 8-speed auto or 6-speed stick. Jeep Wranglers have long been known for their hardy running gear, and the 2018 Wrangler JL takes it up a notch, with several options from mild to ready-for-bear. For the first time in Wrangler history, the 2018 JL can be equipped with the Selec-Trac two-speed transfer case with full time all-wheel drive. For those looking to off-road, there’s the Command-Trac 4×4 system, which includes a two-speed transfer case, heavy duty Dana 44 front and rear axles, with a 3.45 rear axle ratio. For ultimate off-road toughness, step up to the 2018 Wrangler JL Rubicon, with the Rock-Trac 4×4 system, featuring heavy duty next-gen Dana 44 front and rear axles with Tru-Lok locking differentials, a 4.10 gear ratio front and rear, and a “4LO” crawl ratio of 4:1, plus steel skid plates around the fuel tank, transfer case, and transmission. The 2018 Jeep Wrangler JL can brave water up to 30 inches deep without damage, and can crawl up and over obstacles angled at up to 44 degrees, while Rubicon models feature high strength steel “rock rails” to fend off damage while rock crawling. Tougher, stronger and more capable than ever, the all-new 2018 Jeep Wrangler JL is ready to take you where you need to go, whether that’s over the river and through the woods to grandmother’s house, or deep into the darkest heart of the Ozarks, miles from the nearest power pole or tow truck. If you need a four-wheeled friend you can rely on to keep on chugging no matter what Mother Nature throws at you, check out the redesigned 2018 Jeep Wrangler JL at McLarty Daniel CDJRF in Springdale today. Take a test drive, shop our big selection of 2018 Jeep Wrangler JL models online today, and see why this we can say with confidence that this is the pinnacle of what a Jeep Wrangler can be.